Every camera on the market today has enough pixels to make big enlargements, but dynamic range is another matter. Dynamic range varies greatly among cameras and is more important than resolution. Dynamic range is the range of brightness from light to dark that a camera can record before the image turns blank white or dead black. This matters for enlargements because spots of pure white or black in a snapshot enlarge to broader areas noticeably lacking in detail. 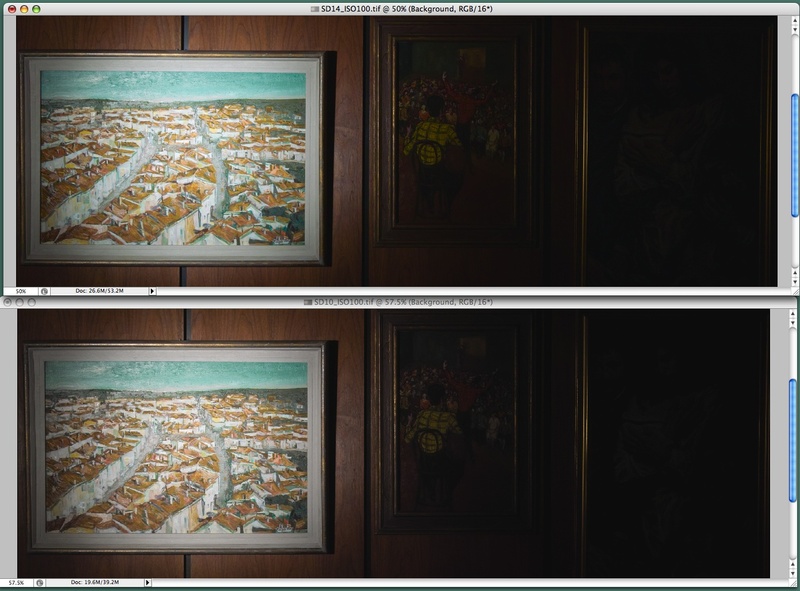 Also, the bottom of a camera’s dynamic range is noisy, so that if the camera has a poor dynamic range, enlarging dark tones will enlarge noise. A New Sensor — Foveon makes uniquely sharp and efficient image sensors with a remarkable dynamic range, but they have had a hard time selling them, largely because the sensors do not sound competitive in resolution. Last spring, however, Foveon announced a new model that they advertise as though it has a V8 under the hood, claiming 14.1 megapixels for it, 40 percent more than its predecessor (and only three times what it actually has). Among Foveon fanciers this generated great excitement but – well, 40 percent more pixels means that the camera can record lines that are 15 percent thinner. The previous sensor already approximated the resolution of the human eye for the kind of information contained in photos. The improvement amounts to being able to read the 20/20 (6/6) line on the doctor’s eye chart clearly instead of with difficulty. Under normal circumstances this will not matter because 20/20 lines are so fine that we virtually never notice them. I don’t know any ophthalmologist who would recommend replacing a pair of glasses to effect so subtle an improvement. Foveon announced their new sensor at the same time that Sigma announced a camera employing it, the SD14. I was not impressed by those announcements. After I read them, my reaction was to purchase a second Sigma SD10, the model using the previous sensor. I did that because to fit 40 percent more pixels in the same area, Foveon needed to shrink each light-sensitive cell. If nothing else in a sensor’s structure is changed, then shrinking cells will add noise and thus limit the detail that can be seen in shadows. Foveon’s propaganda trumpets the increased resolution but provides no useful information about dynamic range. Well, my cynicism was wrong. When I finally got my hands on an SD14 to test, I discovered that Foveon’s marketing obscures a substantial improvement in the structure of the sensor. Despite its higher resolution, the new sensor captures more shadow detail than the old. Testing Dynamic Range — To test dynamic range, I photograph a scene with a tonal range exceeding the capacity of any sensor, then I pull apart the tones in the highlights and shadows at the expense of the middle tones, to see what hidden detail becomes visible. I convert raw 12-bit files to 16-bit TIFFs without any manipulation, then I run a Photoshop action on each of them, an action that first spreads the image across 16 bits and then uses Photoshop’s Curves tool to stretch the highlights and shadows. 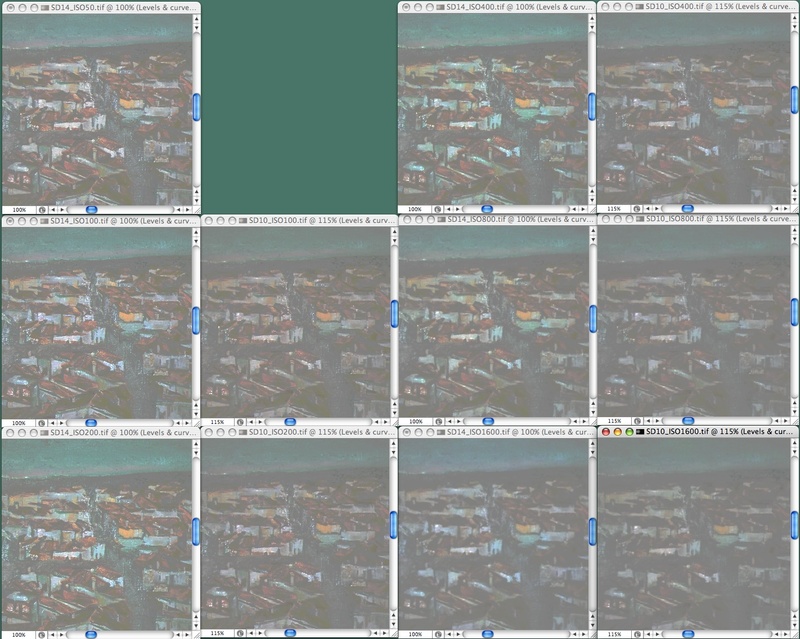 The photos below show the overall scene without any manipulations plus samples of three regions with the tones pulled apart. 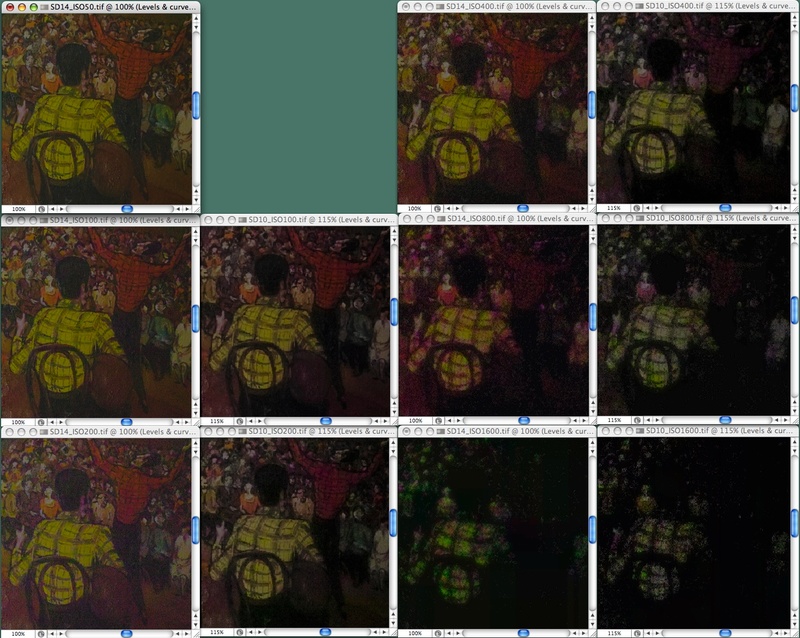 I enlarged the SD10’s images to the size of the SD14’s using simple bicubic interpolations without sharpening. There is no image from the SD10 for ISO 50 because the camera does not offer that speed. 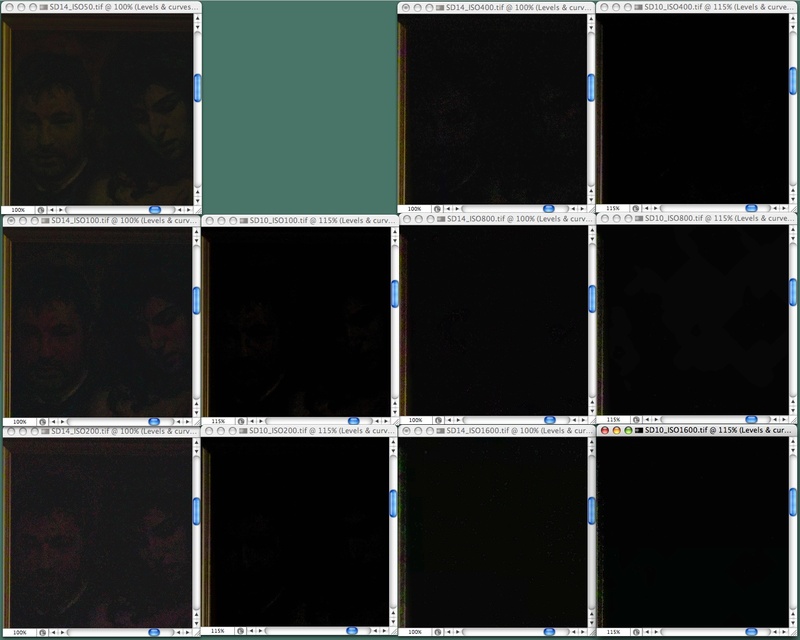 Overall: This is the original image from each camera. The spotlight on the light painting fades rapidly off toward the side, leaving the painting on the right too dark to for any sensor to capture. Bright Area: This compares the bright area of images taken at each ISO speed offered by each camera. For every pair of images you can see that the SD14’s image shows just a bit more detail than the SD10’s image. Dark Area: The images from the SD14 are noticeably better than those from the SD10. Very Dark Area: Here there’s no real question of quality but the SD14 can extract at least some detail at ISO 200 and below, whereas the SD10 cannot. Comparing the SD10 and SD14 — As cameras go, the SD14 and SD10 are very different. The SD14 has a clearer viewfinder than the SD10 and several more features. At first blush it looks more desirable but most of those features strike me as more important for marketing than photography, and they complicate the camera’s controls. Also, although the SD14’s viewfinder is larger and clearer, the SD10’s viewfinder functions like a sportsfinder to facilitate framing moving subjects, and – a clear disadvantage – the SD14 lacks the SD10’s protective cover for the LCD, which leaves the SD14 more fragile. All in all, ignoring the sensor, I don’t see either camera as preferable to the other. I cannot ignore the sensor, however. It is the sensor that captures images, not gadgetry on the camera, and the SD14’s sensor shows less noise than the SD10’s and does a better job capturing tonal extremes. I suspect that most people would not notice the difference but I frequently push the limits of the SD10, so I could not resist the improvement. Anybody care to buy a second-hand SD10?